The setup is a vital part of the golf swing. 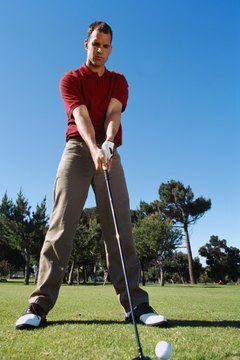 Even a small adjustment to your golf swing can make an enormous difference in the trajectory of the ball. You need a good pre-shot routine, a full shoulder turn on the backswing and a complete follow-through. But it all begins with the proper setup, which will place your body and the club in the correct positions to execute a powerful swing. Address the ball by placing your feet wide--shoulder distance apart--for the tee shot when hitting a driver. This will give you the stability you need to hit a longer club. For other clubs, you will bring your feet in closer to hip-distance apart. Position the ball opposite the inside of your left (front) foot for a tee shot. This ball placement will encourage a wide, sweeping backswing. For other clubs, the ball should be placed closer to the center of your stance. Relax your knees and lean in toward the ball. Your knees will be over your feet, and your shoulders will be over your knees. Release the tension in your arms and shoulders. Your weight will be slightly toward your back leg and shifted back toward your heels. Your left shoulder will be lower than the right shoulder. Maintain your balance and posture throughout the swing. Check your grip to make sure the club is lying across your fingers, and not in the palm of your hand. You should use this position for the golf club whether you are using the interlocking, overlapping or baseball (10-finger) grip. Determine the target line and square the club face and your body to it. Many golfers find that placing an intermediary target approximately two feet from the ball between your feet and the target will keep the swing on line. Allow the club to hover above the ground just a touch.